Speeches are scary. It doesn’t matter if you’re talking in front of your class of ten or ten thousand. Speeches can be difficult to write and even harder to deliver. But don’t worry! Here are our top ten pieces of advice for giving a successful speech. If you don’t like what you’re talking about, your audience won’t. Choose your topic wisely. Don’t write your speech about math if the thought of quadratic equations makes you queasy. If you’re given a topic to speak about, look into it. Find something you like about the subject and focus your speech on that. Don’t write a speech based on opinion alone. Content is everything! Do research. Find quotes and evidence to back up every point you make. Statistics are very good but make sure to keep a balance. Statistics alone mean nothing. Make a point, explain it, and back it up with evidence. Don’t write one draft and leave it. 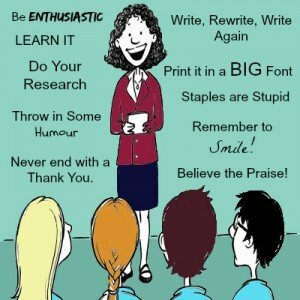 Write your speech, edit it, tweak it, and add hints of humor or sadness. Be happy with the speech. After all, it is you that’s going to have to stand up and say it. A first draft is a lump of clay. Everything is there, but you don’t want to show it to people just yet. Not sure how to edit? 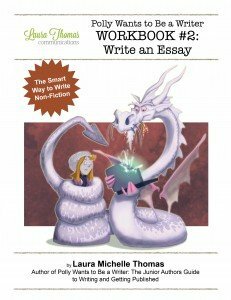 We highly recommend Polly Wants to Be Writer Workbook #2: Write an Essay. It’s a $2.99 CAD download in the LTC store. When appropriate, add some humor. Let your personality shine through. A subtle running joke can have the audience laughing with you, letting both you and your audience relax and enjoy the speech. Avoid negative, self-depreciative humor, though. You’re great, and your speech is fantastic, so there’s no need to make jokes that bring you down. You’ve written your speech, and the day you have to stand up and say it in front of an audience is fast approaching. Don’t hide it away in a drawer and forget about it. Practice the speech in front of a mirror, in front of your friends, in front of your family, and read it before you go to bed. You want to be able to make eye contact and engage with your audience, and you won’t be able to do this if you have your nose in sheets of paper. Type your speech up so you don’t stumble over bits of messy handwriting. You may be fine when practicing, but when you’re nervous, it’s easy to panic and make mistakes. Type it up in a big font. If you lose your place, it’s easier to find it again in size fourteen than size ten. Double spacing is also good. Don’t staple your speech, especially if you’re standing behind a podium or lectern of some sort. You can easily slide loose sheets along a podium, and there won’t be the sound of paper rustling disrupting your speech. Make sure to number the pages clearly, just in case you happen to drop any. That way you can get them back in the right order before you start speaking. I know it sounds stupid. But you’ve put all the effort in to writing your speech. Don’t stand in front of your audience and glare at them the whole time. Relax. Smile. Enjoy it. You’ve done all the hard work. Nothing can go wrong now. It’s over. You’ve said the speech. When people tell you how good it was, believe them. You did well. Don’t shrug your shoulders and say, “But so-and-so was better than me.” Be proud of yourself. Speaking in front of an audience is nerve-wracking, and you’ve just pulled it off. Always work for me. Really great tips Rhianna!